The story behind this post is quite interesting. 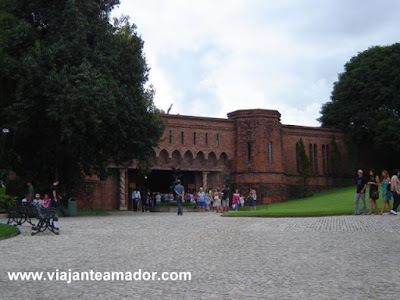 As you can see everywhere else on this page, this is a travel blog written in brazilian Portuguese and it will remain that way. I can't afford to keep murdering the English language that often (as you will notice by the end of the post)... :) However, I felt that I could do some good in writing about my hometown. I hope you like it! Recife is one of the most important cities in northeast Brazil. It is not by accident that the place is usually the first continental port of call of several cruise ships from Europe and USA. It is common to see foreign tourists roaming in downtown Recife with a big map and no idea where to go or what to do next. Since my workplace is right next to Praça da República and Capela Dourada (two major touristic points) I believe I already helped maybe a hundred (or hundreds) of visitors finding their way. Then I thought: how about doing it in my blog? Several big cruise line companies stop in Recife. MSC, Costa, Holland America, Silversea, Regent Seven Seas, Princess Cruises, Oceania Cruises, Voyages of Discovery, Costa Cruise Linea, among others, have already scheduled stops for 2010 and 2011. Most of these stops last between 4 and 10 hours. It´s a very common stop time for cruises but very little time to get to know the city. Try to read about Recife in advance. A very nice online guide in English is Paul Barnett's Recife Guide. There you will find lots of information. Personally, I'll try to give some interesting hints about the city and also some specific itineraries to follow if you are willing to have a solo experience. Although English is a mandatory class in brazilian highschools, it's really rare to find someone able to speak more than a few basic sentences. People can be really friendly, kind and helpful but language can be a big obstacle. Do not rely on communication and plan your time at the city thoroughly unless you speak some Spanish or Italian (which can help you a lot in case you need to ask for directions). Geographically, Recife is divided in 4 sectors: Center, South, North and West. Regular tourists choose a place to stay in South Recife next to Boa Viagem beach. Most of the city hotels are located by the sea. 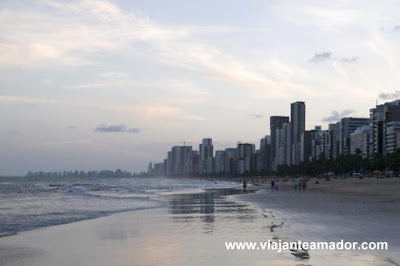 Greater Recife (Região Metropolitana do Recife) is a big area with other 13 cities from the state of Pernambuco. 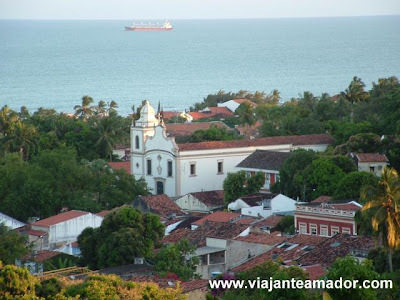 If you plan to stay more than one day, you can find interesting places to visit in Olinda, Igarassu, Itamaracá, Cabo de Santo Agostinho and Ipojuca (the famous Porto de Galinhas' beach is there). Very close to the seaport lies the interesting area called "Recife Antigo" (Old Recife). Praça do Marco Zero is the place where big events happen. The wide open space and windy scenario is perfect for children to play. From the square you can have a nice view of the Parque de Esculturas de Francisco Brennand. You can get there by taking a small boat to cross the channel for an unexpensive fare. Rua do Bom Jesus is a living example of architectural tendencies throughout the centuries. It also houses the Sinagoga Kahal Zur Israel, the first synagoge of the Americas. Kahal Zur Israel Synagogue. Photo: Breno Beltrão. Torre Malakoff, from 1855, another place worth visiting, besides it's original astronomical observatory is also one art gallery and sometimes a nice place to listen to music concerts. Just accross Rio Branco avenue, on the other side of Recife Antigo, you can visit the old customs building (currently Paço Alfândega mall). And if you happen to be there during the weekend, I strongly recommend that you look for any Maracatu band rehearsal at Rua da Moeda. The syncopated beat is absolutely fantastic! After visiting Recife Antigo, cross the bridge and walk towards Praça da República. There you will see Teatro de Santa Isabel, Palácio do Campo das Princesas (Pernambuco's Governor workplace) and Palácio da Justiça (Pernambuco State Supreme Court). Right in the middle of the square lies a huge baobá tree that inspired Saint Exupéry's Little Prince. Just 50 meters from the square, at Rua do Imperador, the Capela Dourada and the Gabinete Português de Leitura are really worth visiting. And if you look for an exotic experience, walk another 800 meters down Rua do Imperador and you will find Mercado de São José and its aromas. Try buying some cashew nuts. You won't regret it. In south Recife you may find relaxation at Praia de Boa Viagem (Boa Viagem beach). If you are into some shopping, proceed to Shopping Center Recife. If you're looking for handicrafts, the places to go are Feirinha de Boa Viagem or Casa da Cultura (downtown Recife). In case you are interested in tasting a little of Pernambuco's countryside food, I recommend paying a visit to Parraxaxá restaurant. It's one of my favourites. 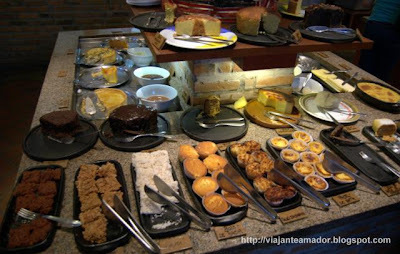 Dessert buffet at Parraxaxá restaurant. Photo: Breno Beltrão. Little known by tourists, in West Recife you will find the 2 most interesting touristical attractions of the city: the "Brennand's". In this neighbourhood, the cousins Francisco Brennand and Ricardo Brennand have built two vast sites that should be visited by every tourist that comes to Recife. The first one is the Oficina de Francisco Brennand (GPS: -8.040618,-34.963646). The place besides being a pottery factory has an enormous open space museum of the artist's sculptures and paintings. It's a magical place indeed. The other attraction is the Instituto Ricardo Brennand (GPS information: intersection of Rua Mario Campelo and Rua Isaac Buril. -8.055761,-34.959247). It is also something almost unbelievable. 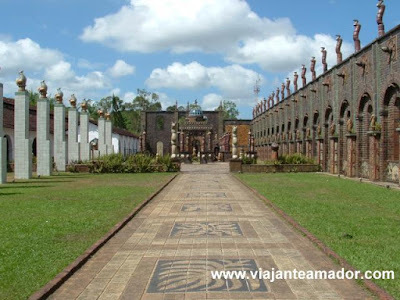 The area houses a 16th and 17th century art museum and a Castle (believe me, it's true, an original european castle in the middle of the tropics) with a huge collection of armors and melee weapons. 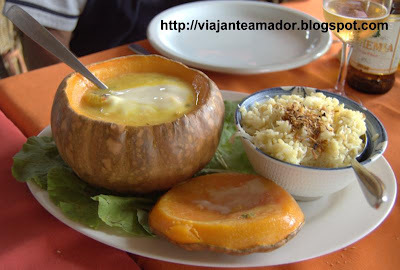 Pumpkin stuffed with Shrimp (Jerimum Frevoé) at Oficina do Sabor. Something you can't miss. Photo: Breno Beltrão. - South and West Recife. Did you like this post? Click the "+1" button and help us promote it.